Happy Monday! 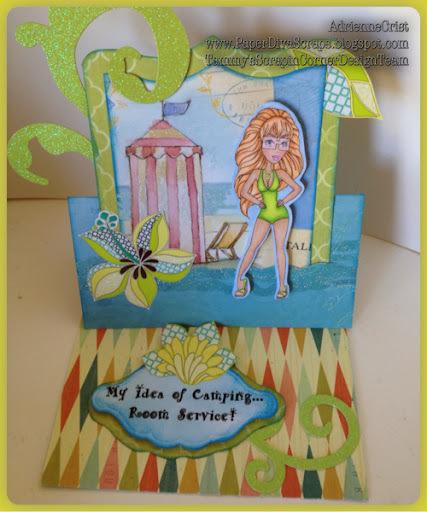 This week at Tammy's Scrapin Corner our challenge is the theme Camping. Sometimes you just can't find the right image that inspires you so I had to think way outside of the box ...I was also pressed for time as my 22nd Wedding Anniversary was yesterday so in the spirit of Diva wives everywhere I adapted this card for my husband to give him a chuckle! 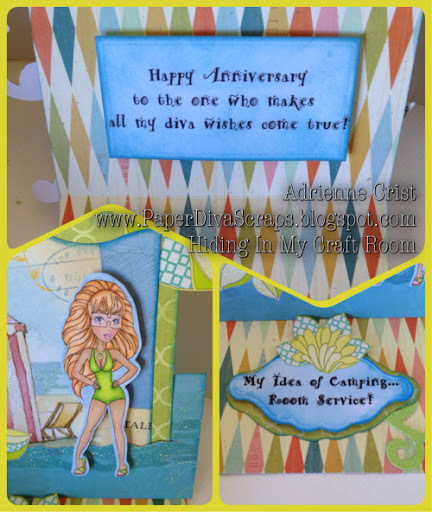 I used a Digi from Sassy Studio called Beach Resort Sassy in honor of our love for the tropics! Actually I do love the outdoors and really enjoy the Mountains, as long as I am accompanied by my Motorhome!!! See, I really am that diva! Please stop by http://tammysscrapincorner this week and join in on the Camping fun, you have a chance to win some digi's from one of our generous sponsors. Thank you for stopping by, I really appreciate you taking the time to check out my art! Now that is definitely glam camping! Fab card Adrienne! Great colours and shapes. What a super fun card! Soooo true for me too! Love all the details and colors! WOW!! !